This is my eleventh Jean Claude Constantin puzzle review, the Raising Tower (a.k.a Scheiterhaufen). 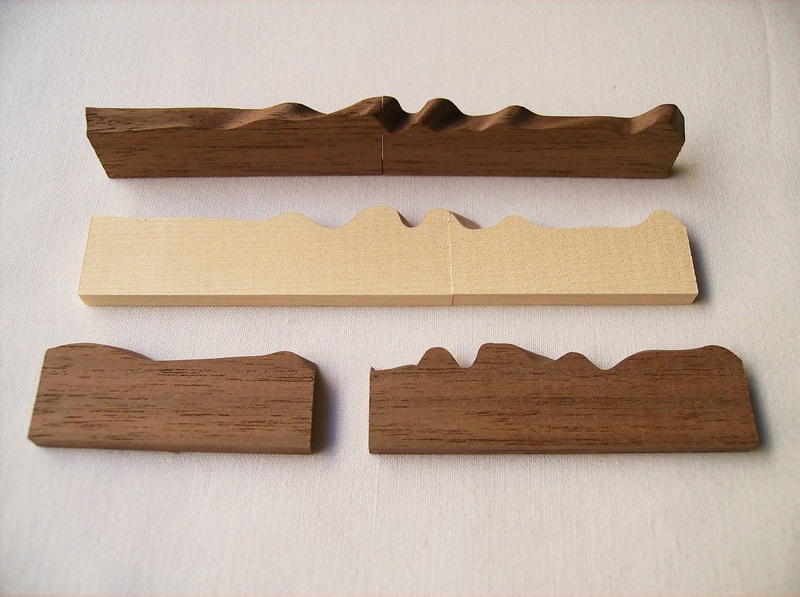 One of the greatest things about his designs is the range of puzzle types he can do, from Wire to Assembly Puzzles, although the predominant material is wood. If you don't like all kinds of puzzles, there's certainly a few of his creations that would be to your liking. The Raising Tower sort of reminds of the popular game Jenga, where you have a stack of blocks that have to be removed and balanced on top until it collapses. The rules here are completely different, though. There are 18 pieces with notches in four types... Well, three if you exclude a single piece with no notches. These types of pieces have one to three notches and the goal is to stack all of them in a nine-storey tower. 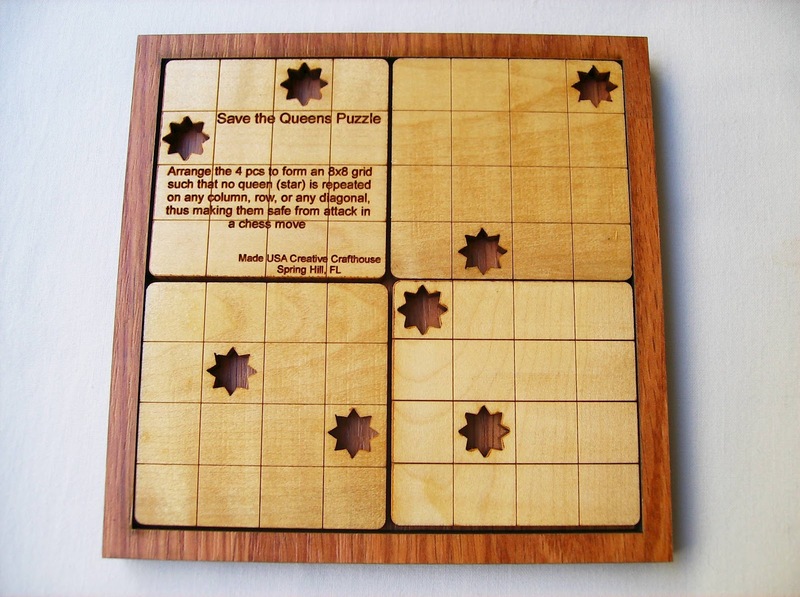 The puzzle is beautifully presented in a three color wood for the pieces (each piece type has its own color), which are more or less separated by the number of notches in them. I say more or less, because the brown colored pieces have two notches, except for one piece that has only one notch. Also, one of the light tone pieces is the odd one out with no single notch. There's a piece that is placed at the top of the stack to prevent the puzzle from collapsing with an accidental push, which is a nice finishing touch. Solving the puzzle was kind of a letdown. This was supposed to be a very hard puzzle, but it turned out to be a trivial challenge. I will explain this ahead, but if you don't want any spoilers, just skip this paragraph. What makes this puzzle visually appealing, the coloring of the pieces is also to blame in giving part of the solution away. The presentation photo at the Brilliant Puzzles website gives spoilers about the color separation in the pieces: brown at the bottom, plain in the middle and red at the top. It's not an exclusive rule, but most of the pieces follow this principle, so I was given a big part of the solution, whether I wanted it or not. With part of the solution already in my knowledge, suffice it to say, I solved it within five minutes. I started with the first group and by the time I was almost done, I just had to make a few adjustments in the piece arrangement, and it was solved. Almost no challenge at all. I have photographed the solved puzzle, but if you want to figure out the solution for yourself, don't click this link. Also, keep in mind that the Brilliant Puzzles photo for this puzzle shows it solved. 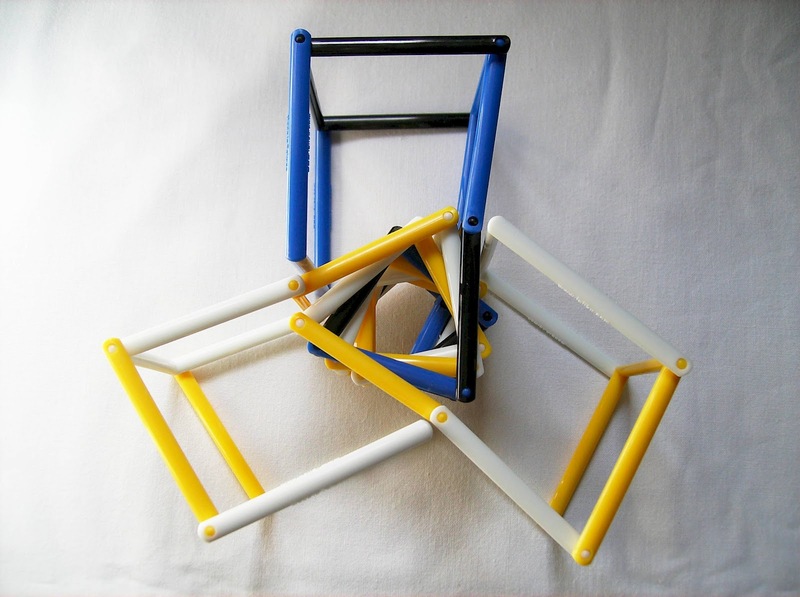 The Raising Tower is available at Brilliant Puzzles for $12 USD. Bottom line, for me as a collector, having another Jean Claude Constantin puzzle is reason enough to have gotten one, but at the same time I feel a little disappointed to have been given most of the solution and didn't enjoy the puzzle like I was expecting. A solution for this? - Simple, if the puzzle had just one color tone. Surely, it would lose part of its visual appearance, but it would gain in solving experience. I have recently mentioned the topic of fast solving puzzles and if they're really worth your money. Fortunately, as a collector, I have other reasons to buy puzzles other than simply solving them, yet I can understand the frustration in someone after spending money on a puzzle, just to have it solved in a few minutes. Yes, I'm sure you'll feel great in the couple of minutes after solving it, but I reckon it's a false joy, because you can't really be that glad to solve a puzzle with no challenge involved. 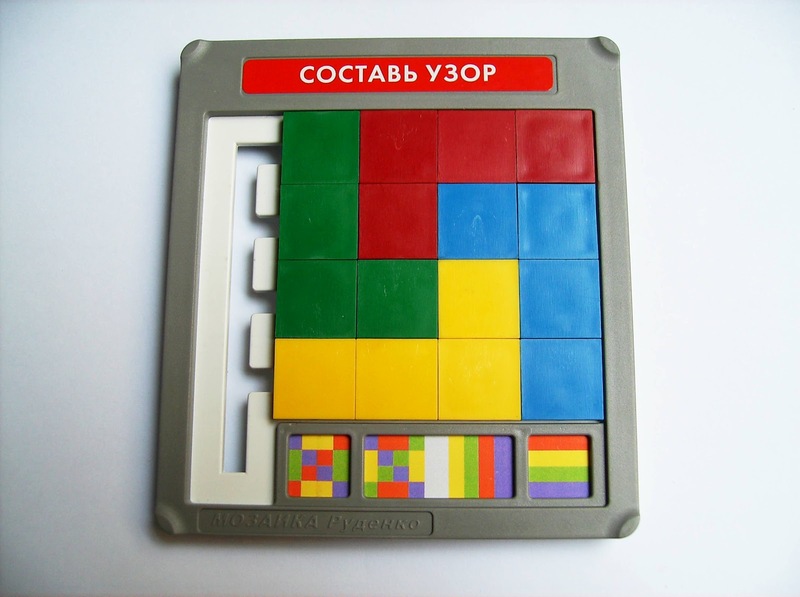 Continuing my Roscreative puzzle reviews, this week I will talk about the Rudenko Mosaic, a very original Slide Puzzle designed by Valery Rudenko (English). 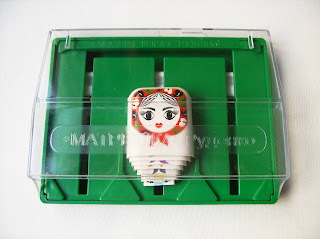 Refer to the Rudenko Disc and Rudenko Matryoshka reviews for more detailed information about each one. 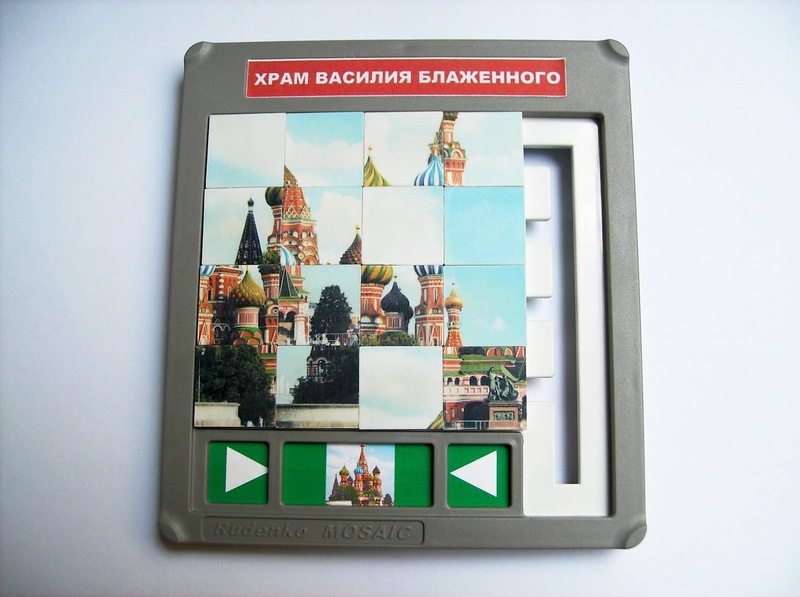 The Rudenko Mosaic, as stated above, is a 10 x 12cm (4" x 4.7") slide puzzle with 16 tiles, each one containing a fragment of a whole picture that you need to scramble and rearrange. What's more interesting is that the Mosaic is a double-sided challenge. Just flip it over and you have another puzzle. This is Roscreative's puzzle with more versions available on their website. 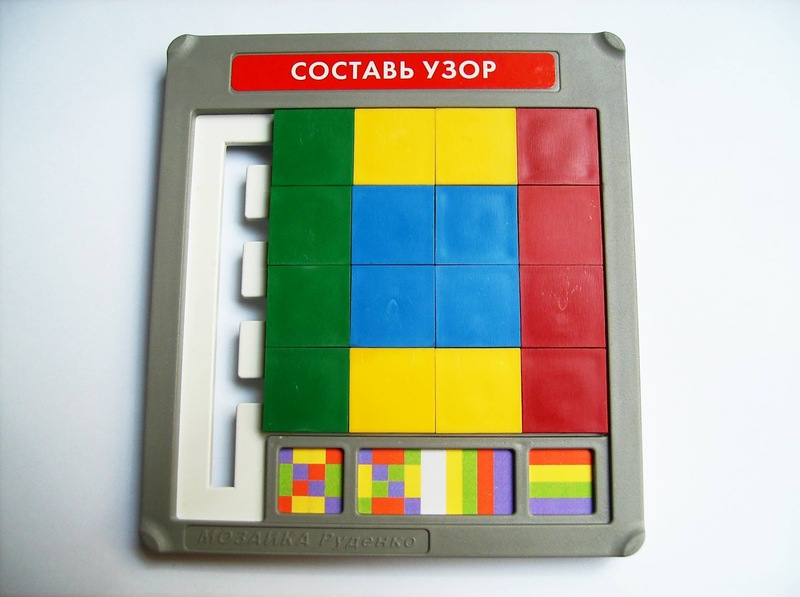 As far as I know, there's currently 12 different Rudenko Mosaic puzzles, ranging from a wide variety of themes and pictures. From all those versions, the one that got the most of my attention was the Rudenko Mosaic - St. Basil's Cathedral, one of the most famous Russian Landmarks. 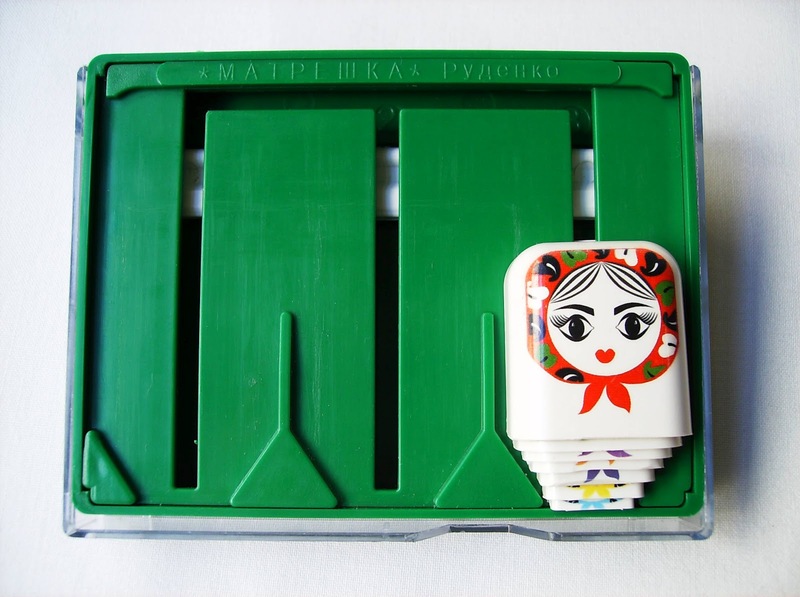 Since this is a Russian puzzle, I thought it was a fitting choice. On the backside is a colorful mosaic with four colors to make several different patterns. 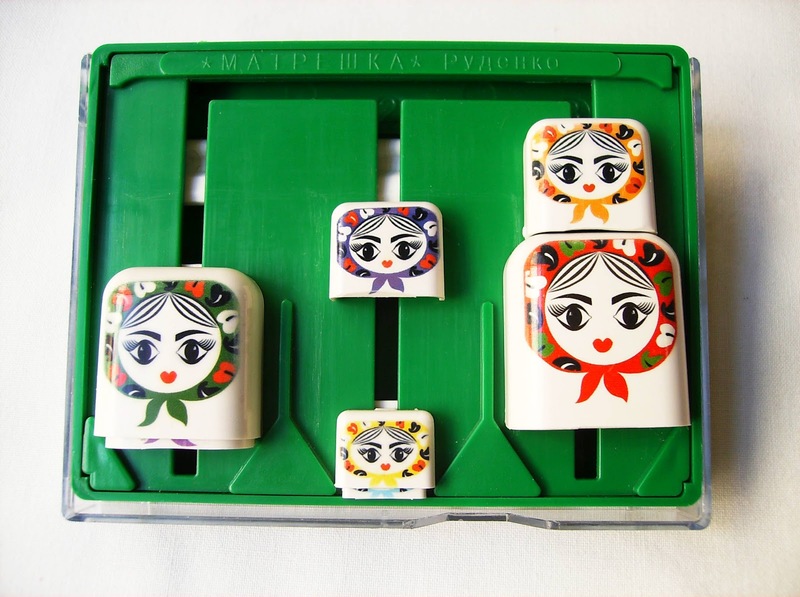 What distinguishes the Rudenko Mosaic from other slide puzzles is the way you play it. The concept is totally new. You have four parallel rows connected at one end by a column and one extra space for a tile. Think of this column as a common hub between all four rows. When you need one of the tiles to be placed in a different row, it has to pass through that column at the right. 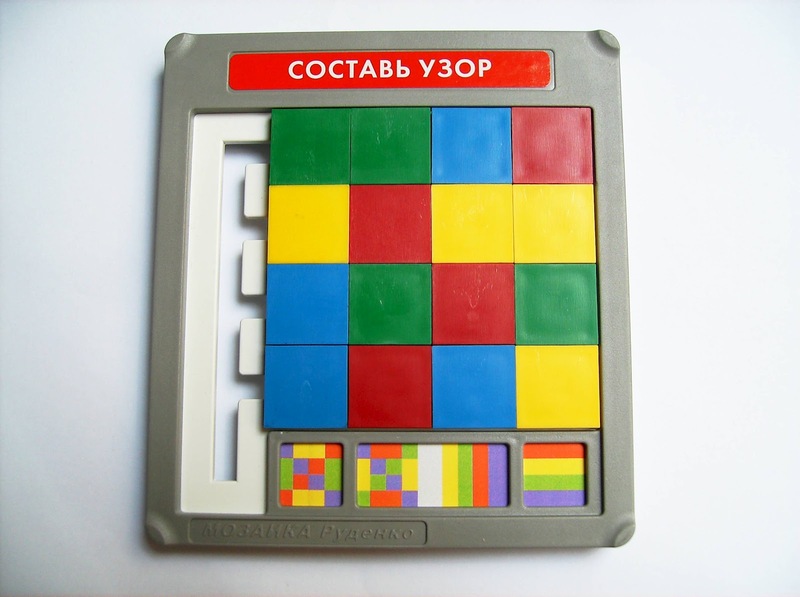 Compared to the more classic slide puzzles, I would say it's a bit easier to solve and less complex. The learning curve is probably around 5 to 10 minutes. After that, it doesn't offer much challenge, but it doesn't stop it from being a very fun puzzle to play with. The main side has basically two states, scrambled and solved. However, the backside with colored tiles has dozens of them, and to me, as a pattern making fan, it's the most fun part. There's no right or wrong with this challenge, as it's up to you how many different patterns you can create. 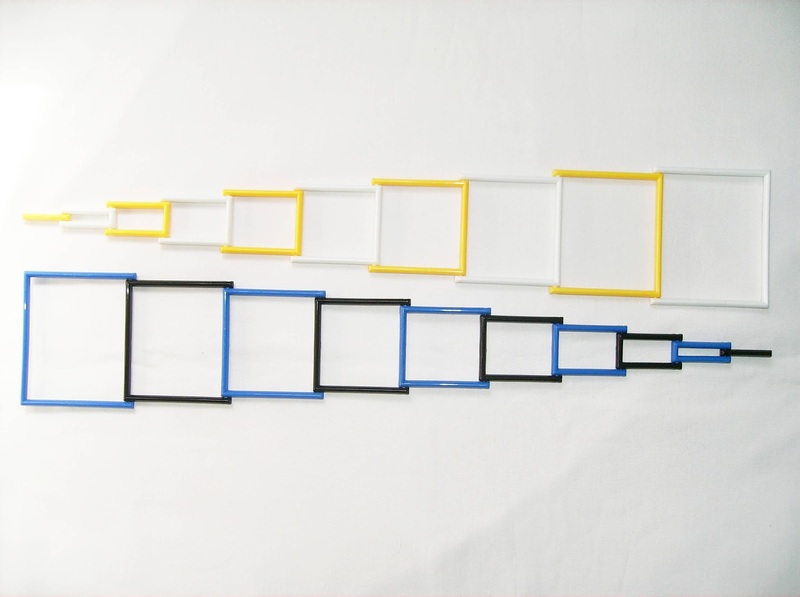 There are four examples at the bottom of puzzle, but the number of possibilities is huge, e.g., vertical or horizontal strips, diagonals, etc. From my experience with the puzzle in the past few weeks, and unless I'm missing something, the top right tile (viewed from the colored tiles side) is impossible to be swapped for another one. Every other tile can pretty much be placed anywhere in the matrix, but the top right corner. For that, it would be needed another extra space at the top left corner of the puzzle, just like the bottom left one. Nevertheless, there's still plenty of patterns you can do, just keep in mind that whatever pattern you think of, it has to include a red tile at the top right. I liked every Rudenko puzzle so far, but the Mosaic has to be one of my favorites. It's a mixture of original concept, never seen before in slide puzzles, with the possibility of pattern making, something that I love about puzzles. The wide variety of themes you can choose from is also big plus, because you don't have to get this exact copy. For example, if you like airplanes or anything related to the military, the Rudenko Mosaic - Victory Weapon (English) is the right choice for you. Of course, if you're a collector like myself and if you can get all them, that's even better. 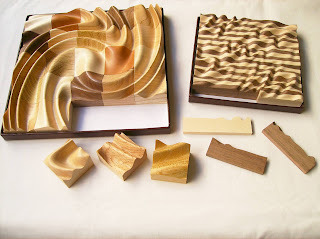 Puzzle Crafthouse (also known as Creative Crafthouse) make at their Florida shop, extremely high quality wooden puzzles. From these designs, some are unique to them, so you won't find them anywhere else. 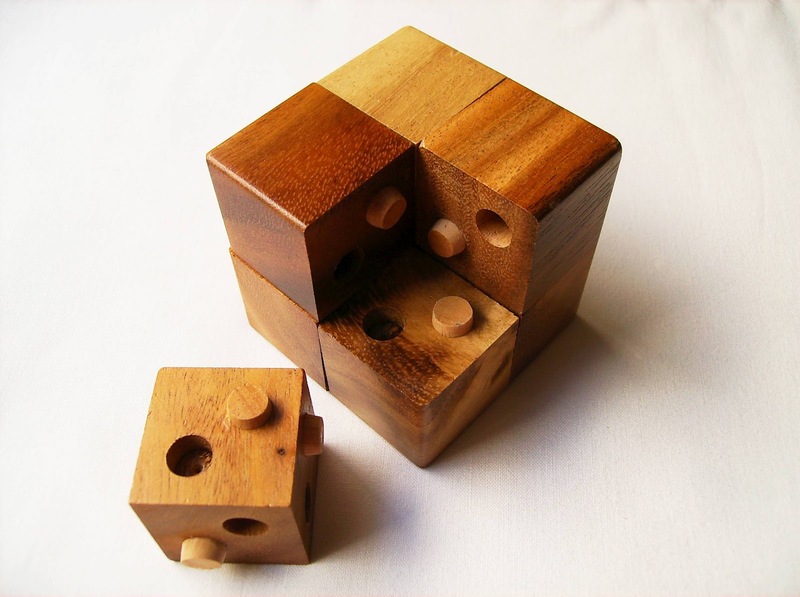 The Reilly's Cube, invented by Mike Reilly is one of such puzzles. The cube is comprised of eight pieces and each one has three faces with a diagonal combination of a pin and a hole. You have to match the pins and holes of all pieces to assemble the cube. 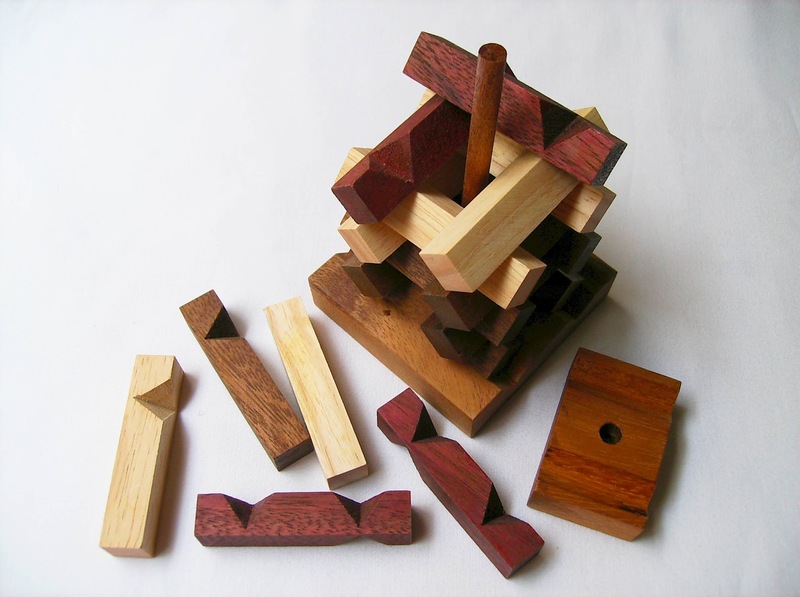 The puzzle is made from Raintree hardwood and it's beautifully crafted with round edges. The outside surface of the cubes is also very smooth to touch, product of a high quality finish work. I was very curious about this design when I first saw it, because I already had in my collection a similar puzzle, but less complex. 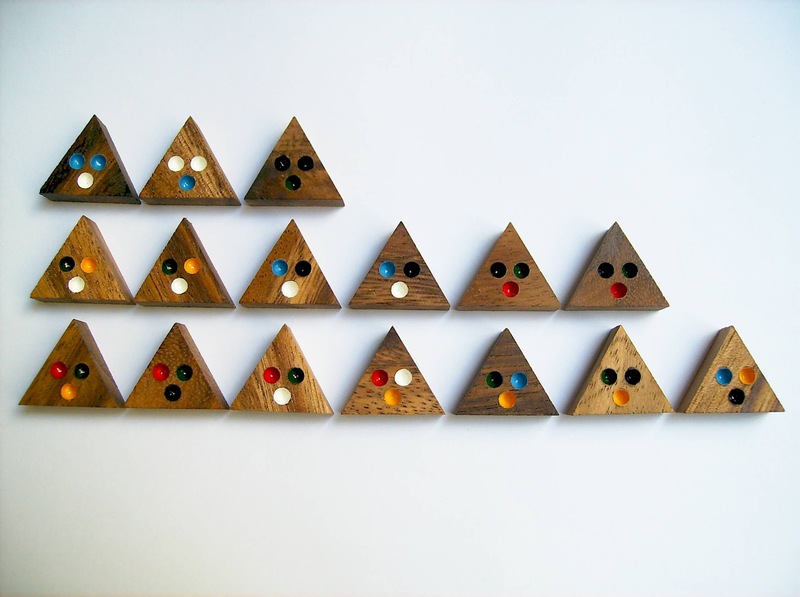 The main difference is that the Reilly's Cube has a set of hole and pin in three faces, and the other one I have has only a pin or a hole in each of those faces. This one's definitely a lot more complex. Knowing that I was before a much harder puzzle, I was expecting to spend a not so reasonable amount of time working on its solution. Not quite... It took me around 15 minutes or so to find the correct solution. Whether I had the help of lady luck or not, I'm not certain, but I might have to try and solve it again just to be sure. I did found a couple of times, partial solutions with just one piece left, though. This can be rather frustrating if it happens multiple times in a row. Despite having just eight pieces, and if you think about it, they are all corner pieces, it doesn't look too difficult. Just grab two pieces and see if they match. If not, grab another and repeat the process until you succeed, as there's now only seven pieces left to check. Simple, right? - Wrong. There's more to it than just meets the eye. The common mistake I found myself making, shortly after starting to solve it, was that I was only checking one of the faces as a possible match. Then it hit me: "If I rotate the piece around its corner vertex, there's a total of three possibilities for it to match the other piece". This may sound like an obvious assumption, but believe me, it's not that simple. Considering this, it comes to a total of several thousand possible combinations. I came to the total number of 6561 by considering three possibilities for each of the eight pieces (38). I could be wrong with my interpretation of the possibilities, so take this with a grain of salt, but I know the possibilities are in the several thousands. In case you're wondering if the puzzle has more than one solution, which would explain the easiness to find one, according to the inventor himself, it's only one, therefore the question of luck might be valid. To consider that one solution, we have to carefully analyze the puzzle. 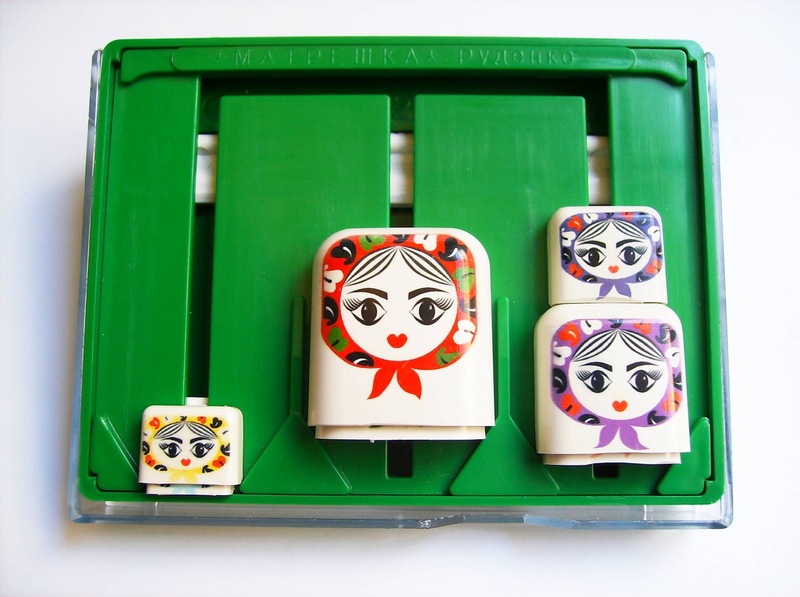 One known fact is that there are three pairs of identical pieces and the remaining two are unique, so in total, there's five unique face patterns. To consider a unique solution we can't count as different, swapping places with two identical pieces, as the interlock pattern of pins and holes wouldn't suffer a change per se. Many possibilities, but only one correct. The Reilly's Cube is a worthy addition to any puzzle collection. Its high quality alone is enough to convince anyone who appreciates a good puzzle, but the challenge involved is what makes it so special and appealing. Yes, it took me only 15 minutes to solve (with a bit of luck), and you know how I feel about puzzles that take so little time to be solved, but this is considered a hard puzzle (level 4/5), so I might not be so lucky next time. If you're into assembly puzzles, go for it, it's really worth it. 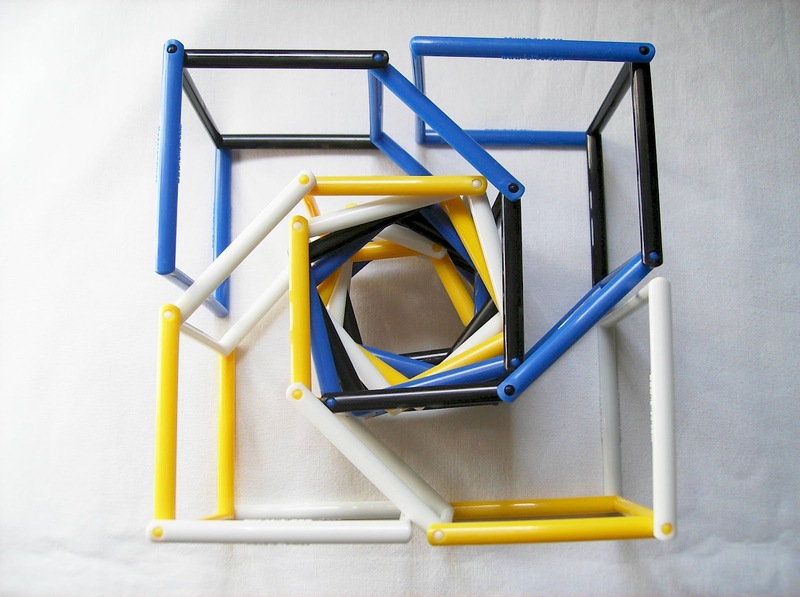 The Reilly's Cube is available at Puzzle Crafthouse for $17 USD. Dreiecksbeziehung. Now that's a mouthful! Can you pronounce it? 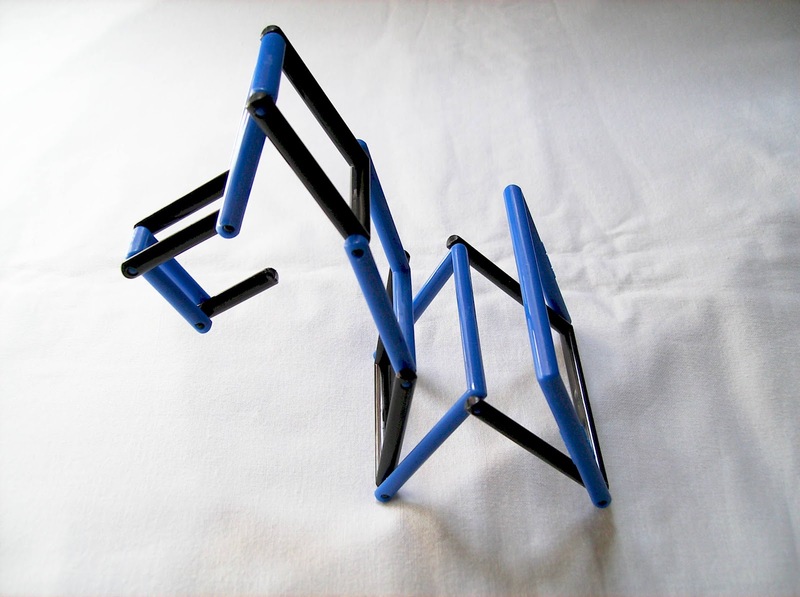 - Dreiecksbeziehung (German for triangle relationship) is another great design by -Who else?- Jean Claude Constantin. The name of the puzzle is a well fitting description to understand how the triangle properties relate to the actual solution. 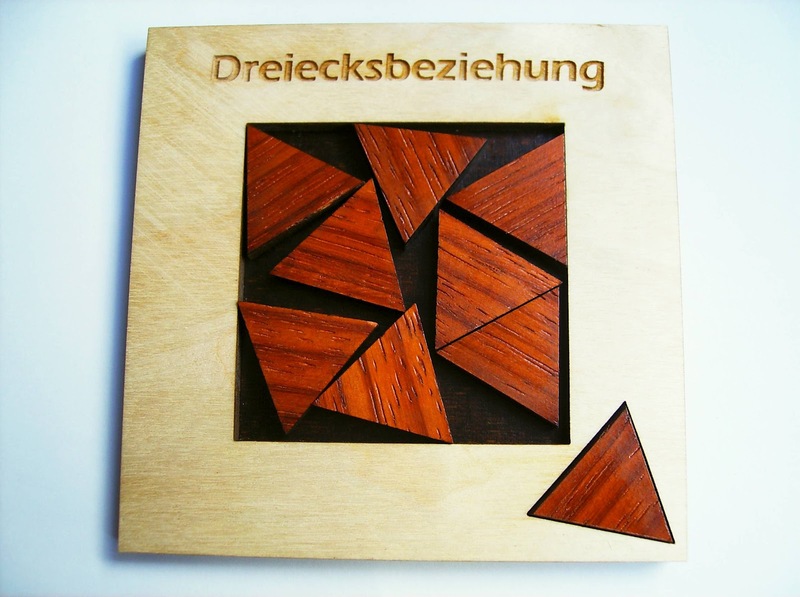 This Packing Puzzle is made from laser cut wood and it's comprised of nine identical triangles. It is relatively small, with the frame measuring just over 10cm (about 4") and each triangle measuring exactly 2.6cm (1"). The packing area is an exact square with 6cm in length. Inside the frame there are eight triangles and there's a slot in the frame's border to store the extra triangle. The goal, as it would be expected, is to try packing the ninth triangle inside the tray as well. Note that the pieces won't fill the entire tray area. Pretty simple, but it can be rather tricky. The design is very well made, with the name of the puzzle nicely engraved onto the frame. The contrast between the frame's light color and the dark tone of the triangles is also perfectly achieved, as it brings more focus to the main feature of the puzzle, the triangles. Solving the Dreiecksbeziehung puzzle was a lot harder than I would expect, mainly because it's rated by PuzzleMaster as a 6/10, which is considered an easy puzzle. Despite the apparent easiness and after I've spent close to two hours between three attempts, I wouldn't consider this an easy puzzle, at all. Probably more like a 7 or 8/10. What I found harder is that no matter how I would try to rearrange the pieces, it would always leave just a tiny portion of the triangle out of the frame. My understanding was that the final solution had to be extremely tight, and I also believed that it probably wouldn't be a symmetrical arrangement as I first thought. Both my assumptions proved to be correct in the end, when I finally packed that damned ninth triangle. Since, as I thought, the fit between the pieces was so tight (no wobble), I had to check the solution to see if I did it right. Apparently I did, but the solution was a bit different from mine, so I tried to pack the pieces that way as well. As I suspected, PuzzleMaster's solution was just as tight as mine. For you to have an idea of the tightness I'm talking about, you need to apply a bit of down force to the last piece in order to fit in the tray... And it's not easy to remove the pieces once they're all packed. Be careful, as you might break a piece in the process. You can see both solutions, PuzzleMaster's and mine. 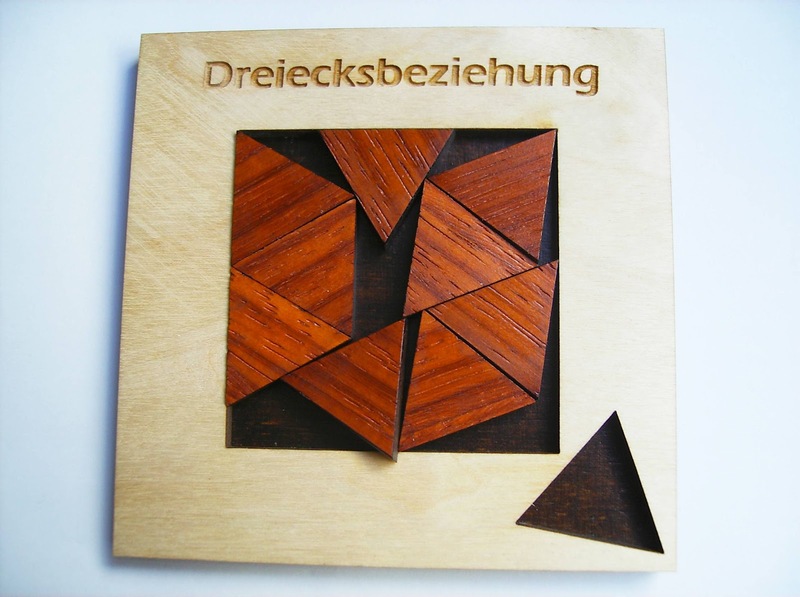 The Dreiecksbeziehung is available at PuzzleMaster for $20 USD. I really liked the challenge of the Dreiecksbeziehung and of course, its elegant design. While it was harder than I was expecting, I liked the fact that I had to spend more time with a great puzzle. It wouldn't be so fun, had I just solved it in five or ten minutes now would it? When you spend twenty dollars or more on a puzzle, you expect it to be worth it, not be done with it in a heartbeat. Why the Jeliku name? - According to the inventor, Mr. Jerry Chen, the first prototype had irregular bubbles with a transparent crystal appearance when reflected by light. Thinking it looked cool, he named it Jeliku. The Jeliku comes packaged in its folded state, not much bigger than a credit card. 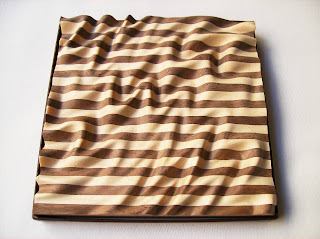 However, when you unfold it, it can stretch as much as about 45cm (approx. 18") with its 10 different sized segments. 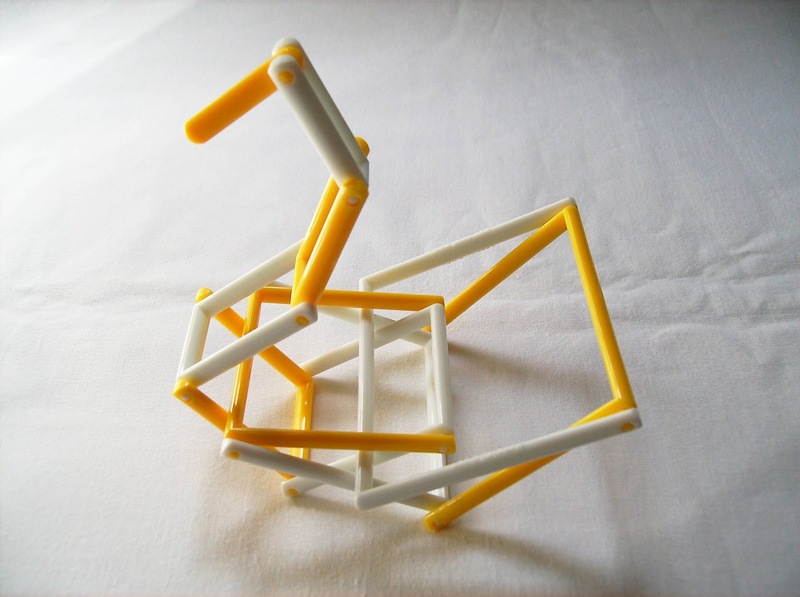 The puzzle is made of a strong, but flexible high quality plastic material (Nylon) and its joints are tight enough that when manipulated, it stays in the position you want it to be, which is what you'd expect from such product. Worth noting is that the segments are directly connected by each other, thus reducing drastically the wear and tear and improving at the same time its tenacity. There are 41 available colored combinations distributed in three main categories: Single color, 2 color combination and 5 color combination. This wide variety of choice allows to choose the colors that better suit your creativity. For me, I like the effect of just two contrasting colors. It's a simple combination, but the visual results are great. My combinations of choice weren't available at the time (White/Blue and Black/White), so I had to settle with Black/Blue and Yellow/White. Not the best option, but still nice. 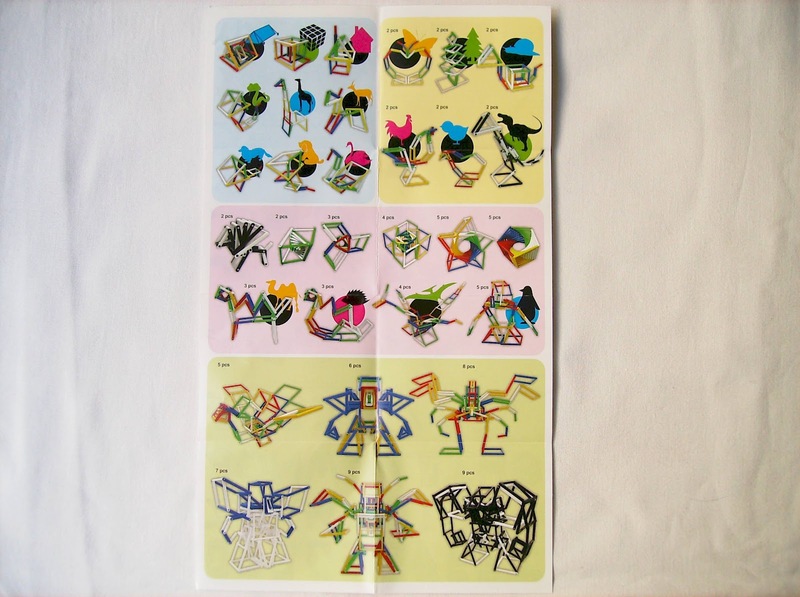 Packaged with your Jeliku is a leaflet with a several examples of what can be built with your puzzle. 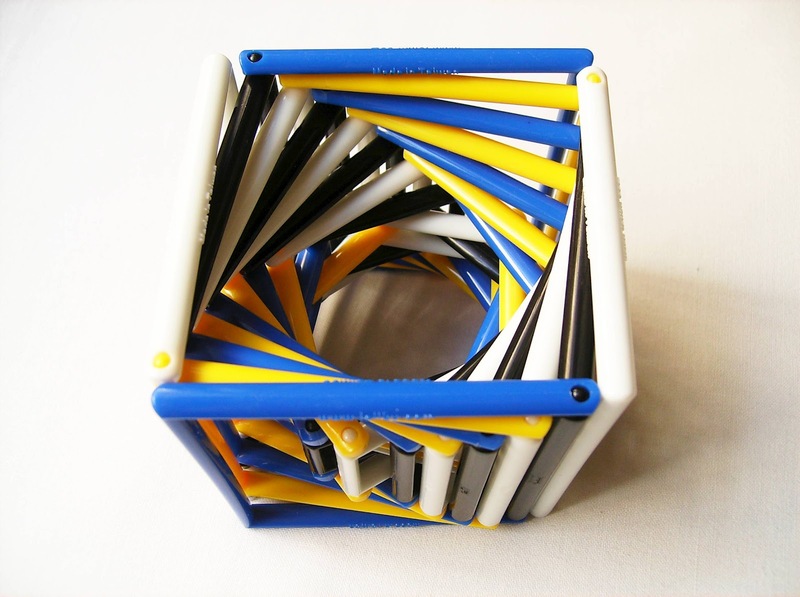 A great feature is that you can purchase multiple Jeliku puzzles and join them together to form even more complex structures. The leaflet shows examples for figures made with just one puzzle and up to ten, but there's virtually no limit to the number of Jeliku you can use - If you imagine it, you can build it. The variety of structures and uses for the Jeliku are also limited to your imagination. 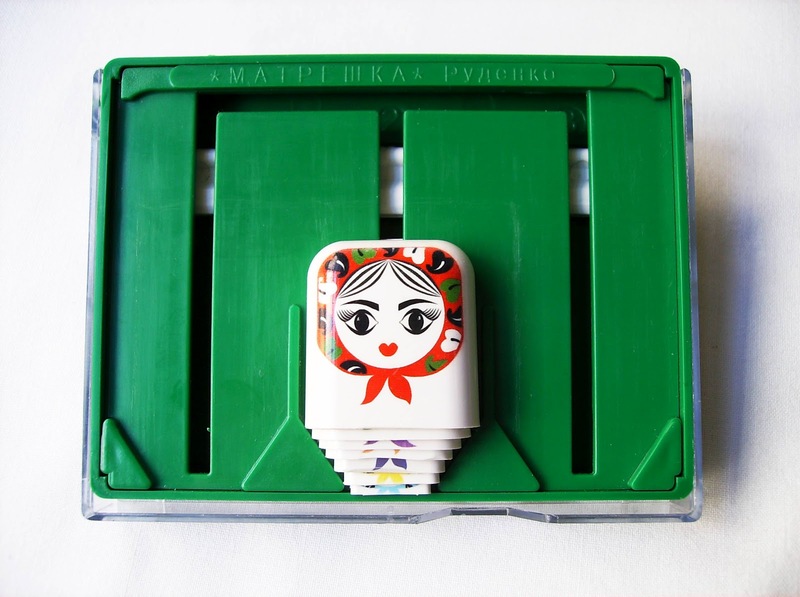 You can even use it as stationery objects such as pen holders and cell phone holders or as a mere decorative object. 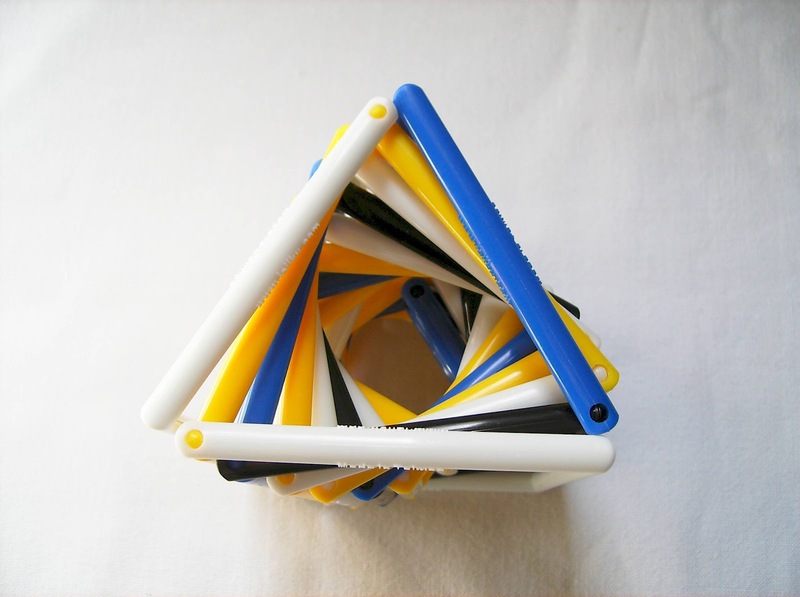 Jeliku is a great and fun puzzle to enhance your creativity. Its versatility to create anything you can think of, associated with the fact that you can join many units together, makes it hard to put it down once you start fiddling with it. As of now, I believe they are only manufactured in plastic, but I would also like to see it in a stronger material, like a metal alloy and it would be interesting to have a version with more than 10 segments. Until then, the plastic version is worth checking out. Update (March 27) - I was informed that there was indeed a prototype metal version of Jeliku, but in order for it to be certified in many countries as a toy, it had to comply with many international safety and testing regulations. See this page for more info. Maybe the metal version can still be produced and marketed as an executive premium toy instead of just being considered as a kids toy. 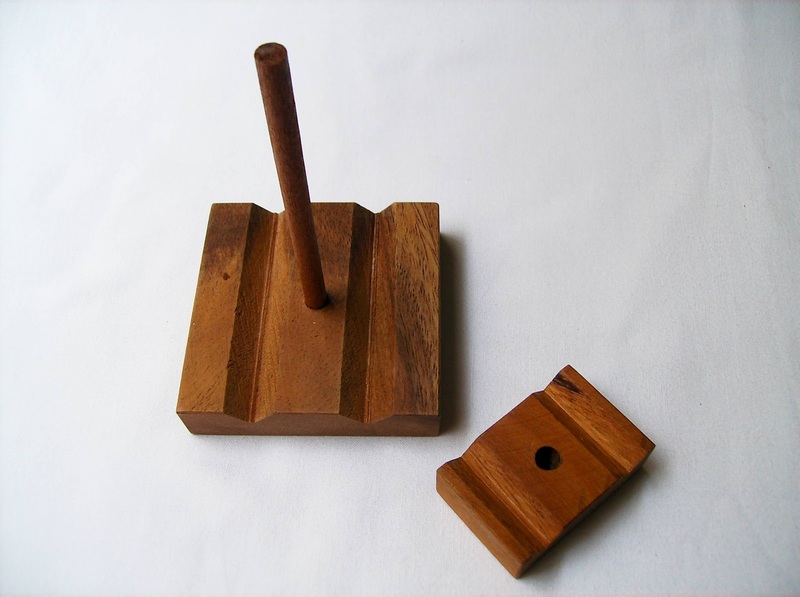 The Jeliku is widely available at many places around the globe. I'll leave you with a couple of online options, but there are plenty more if you Google it. Amazon sells the first version (smaller) for about $10/unit and at Idear in Europe (Spain), they sell the second version (bigger, round frame and brighter colors) for about €10. Gallery: I've listed below a few pictures with examples of what can be done with one, two, three or four Jeliku puzzles. 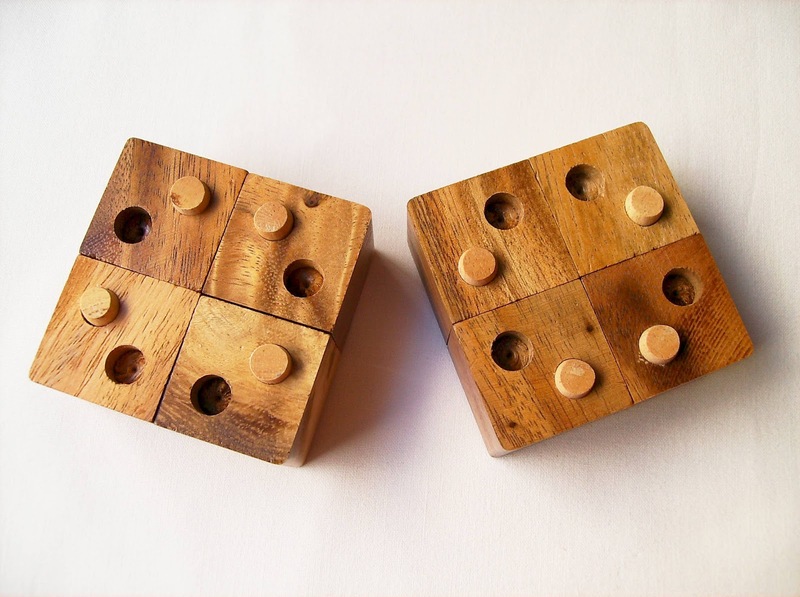 Pattern-Matching, or more precisely Edge-Matching puzzles, are simple concepts, but can take a a while to solve. 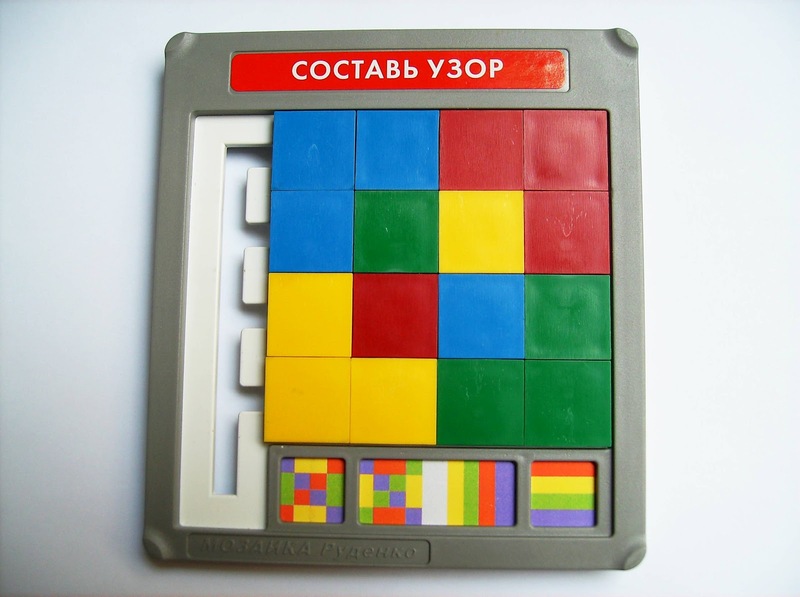 The Color Match Triangle is one of these puzzles. 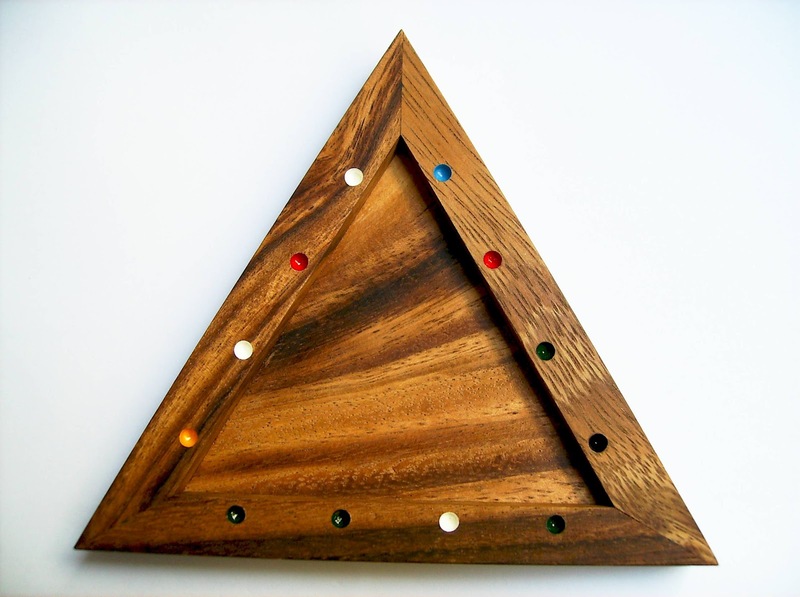 First produced by Lagoon Games and known simply as Tri Puzzle, the Color Match Triangle is comprised of 16 triangular wooden tiles, each with a colored dot in its three edges. 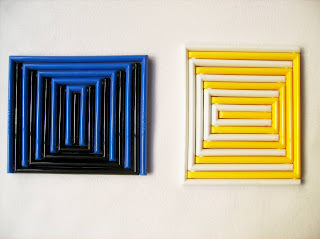 There are six different colors scattered in several tile configurations. While matching the triangle edges, you also need to take into account having to match them with the color configuration on the tray. This concept reminds of the Triazzle, only it has colored dots instead of pictures and it's a lot smaller (about 15cm edge long [6"]). Another difference is that in this puzzle there are a few identical pairs of pieces, which simplifies the total number of possibilities. Still, the total number of possibilities is astronomical, so you won't notice the difference. What's surprising is that in this type of puzzles, despite the large amount of possible arrangements, usually there's only one solution. As a fan of pattern puzzles, I always like to try different designs and this one was quite interesting. 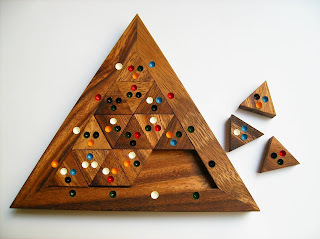 I already had a similar puzzle with colored dots in my collection, although different in shape and less complex. After I have solved the Triazzle in a relatively short amount of time, I figured this one wouldn't be so different, giving the similarity in concept. Wrong assumption... It took me quite a while to solve it. About an hour and a half to be exact - contrasting with the 15 minutes needed for the Triazzle, it's as lot. If you want to take a look at the solution, click this link. My take on this is that finding a solution is more about luck than skill. You just have to be persistent and have patience, because with systematic attempts you'll eventually solve it sooner or later. 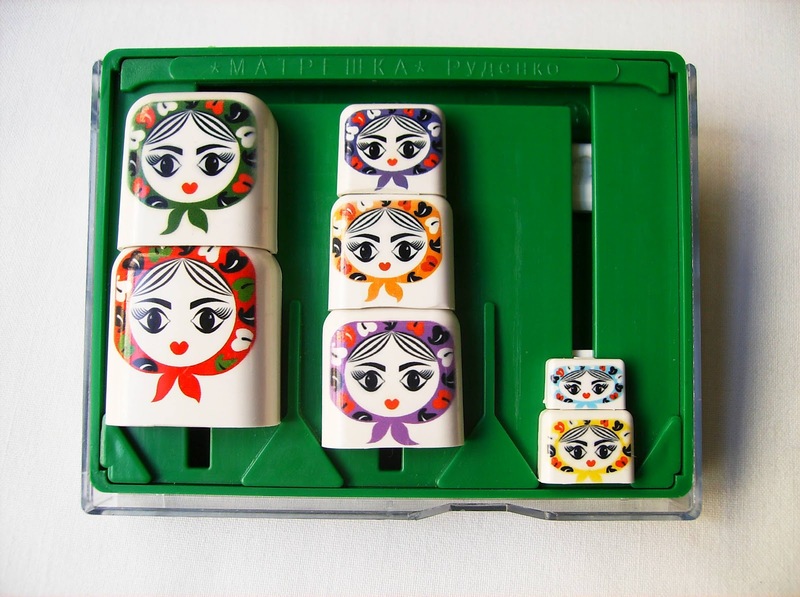 What's more frustrating is that when you're close to the end, and you're left with four or five pieces and unable to fit them, there's no way of telling if you just need to swap one of the tiles in the middle or close to the end. Better yet, if none of the previous attempts work, you need to start again from the top. 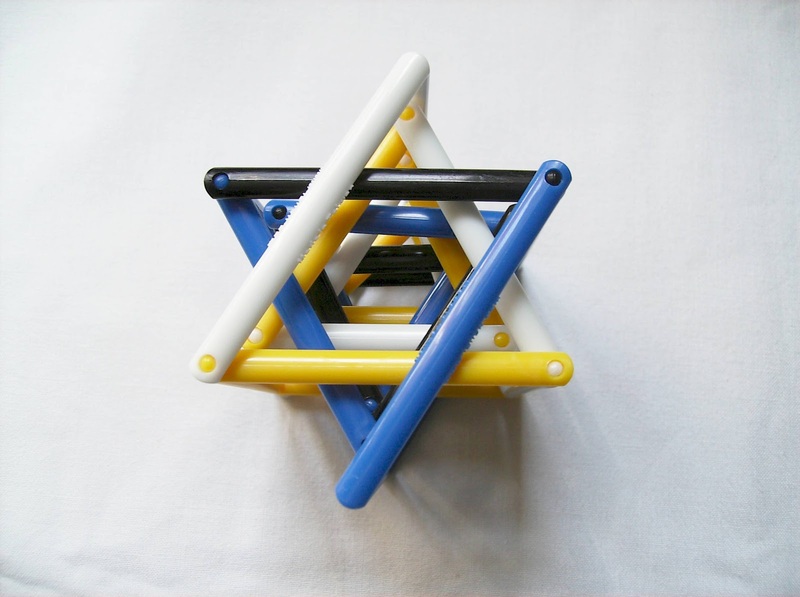 The Color Match Triangle is available at Brilliant Puzzles for $8.95 USD. This is a type of puzzle that ultimately needs a lot of patience on your side. There's not a particular strategy, at least to my knowledge, that can be used to simplify the solving process, which can throw off some people that like to take full control of their skills and not be put entirely to the mercy of mere luck. It's a recommended puzzle for the casual puzzler. Before I start my review, a bit of news first - As some of you might already noticed from the banner at the left, Creative Crafthouse has now a new website with a nicer and fresher look, Puzzle Crafthouse. You can still access the old website for now, but in the meantime, check out what's different on the new one. To help with the transition, I have updated my previous reviews to point to the new website and the Creative Crafthouse label has been replaced by a new Puzzle Crafthouse label. You're welcome to leave feedback on the new website look and features and I'll be sure to pass them onto them or you can use their contact form. 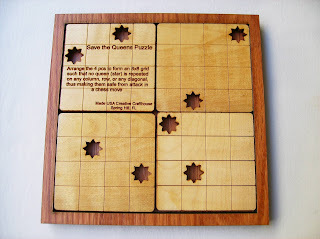 The new puzzle I got from Puzzle Crafthouse was the Save the Queen puzzle, which is based on an old design from 1979, the Brain Drain. You have four square pieces, each with a 4x4 grid and two star shapes (representing a chess queen) occupying two of its sixteen spaces. Your task is to arrange the four pieces in an 8x8 grid Pattern in the tray, so that no two queens can be seen in the same row, column or any diagonal (not just the two main ones), this way saving them from a chess type move attack. The pieces can be rotated and are double sided, so it will double your chances for failure... You can also see the rules beautifully engraved on one of the pieces. This particular version is made at Puzzle Crafthouse and it's crafted from thick Maine hardwoods. The one you'll get can be from Ash, Maple or Birch wood. A great thing about the puzzle that I immediately noticed was that the pieces had this shiny golden effect finish, only made possible by a polyurethane coating. It's the first time, at least that I can remember, I've seen it used on a wooden puzzle. While it helps to protect the wood, at the same time it gives off an amazing look to the overall appearance of the puzzle. 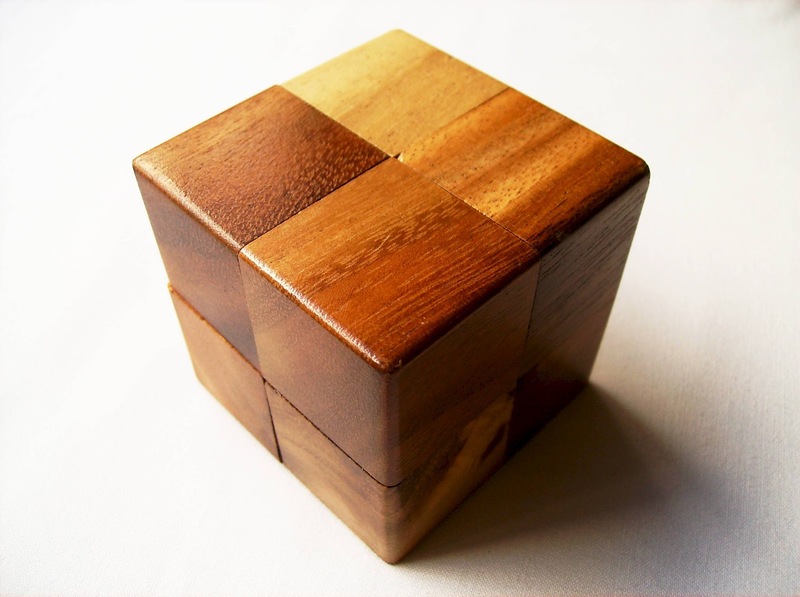 The concept of the puzzle is very easy to understand, but solving it might not be so simple. There's only one solution in over 12.000 possible orientations, leaving a lot wrong possibilities. What seems fascinating is the deceptively hard challenge you're presented with. When one looks at just four pieces and a set of simple rules, it is led to believe that the solution is easily reached within a reasonable amount of time. At first, these were my exact thoughts, but within 5 minutes, I had changed my mind. Many times, I thought I had it solved, but much to my despair, when checking for diagonal matches, I had two queens in the same line of sight. This was getting frustrating... After almost half an hour under constant attack, the queens were finally saved. If you want to see the solution, check this link, although it will be much more rewarding if you solve it on your own. 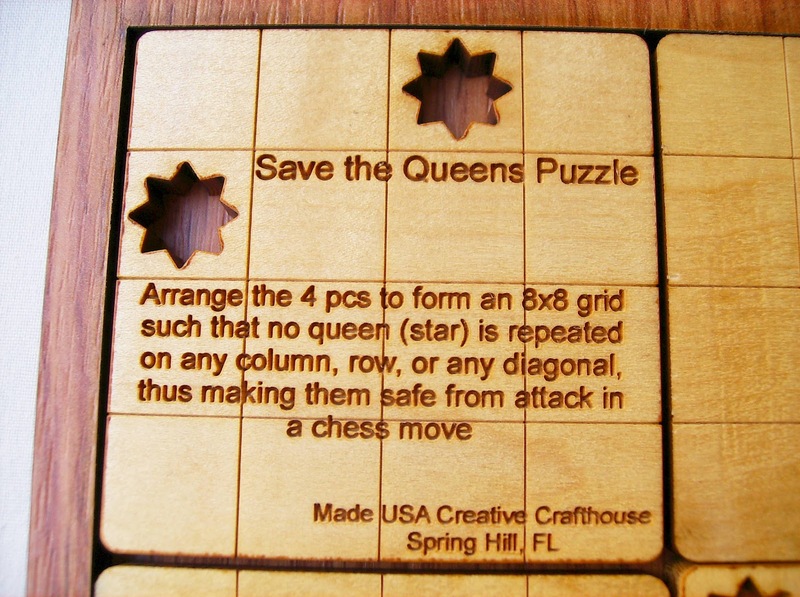 The Save the Queen puzzle is available exclusively at Puzzle Crafthouse (or Creative Crafthouse for the time being) for $13.50 USD. For an additional $4 fee, you can get any message engraved on the puzzle. The concept of not repeating objects in straight lines is certainly not new, but I liked the original approach of this design, with chess roots. I was very impressed by the superb quality of the pieces with this new coating finish, and I've been told that all future Picture Frame puzzles from Puzzle Crafthouse will have it, so I will look very much forward to that. 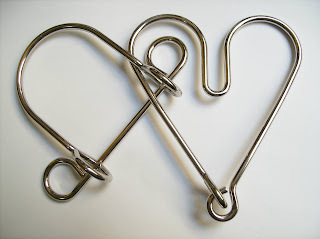 Following last week's topic about easy Wire Puzzles, which by the way are great to learn the basics in order to solve harder ones, I have just another one, the Heart Breaker. 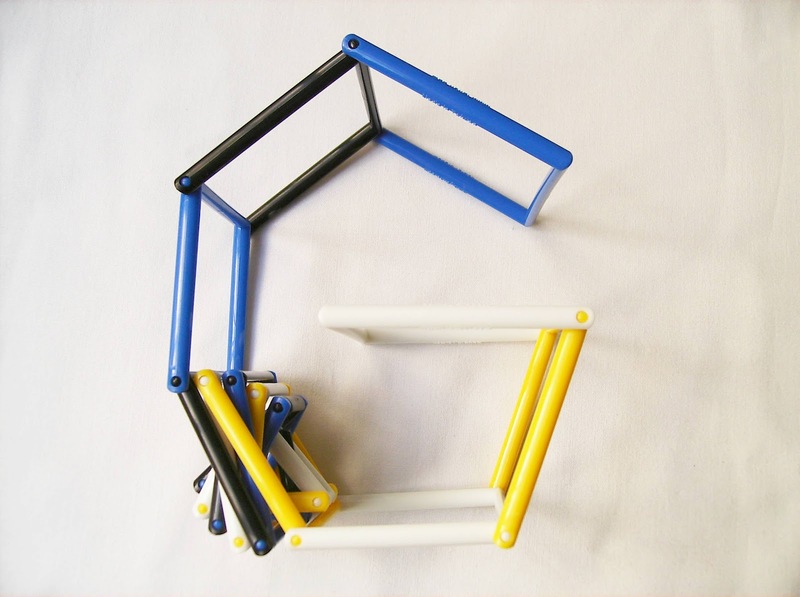 This puzzle is manufactured by PuzzleMaster and it's a more affordable version of Tucker-Jones House's Iron Heart from 1981. The Heart Breaker is comprised by two parts, one of them in the shape of a heart. To "break" the heart, you have to separate the two parts. The description of the puzzle says to remove the heart shape, but the funny thing is that when I looked at the puzzle and solved it, I interpreted it as if I just had the other part removed from the heart shape, not the other way around. I know both interpretations lead to the same exact end, because after all, the goal is to separate both parts. Nevertheless, it's interesting how we, looking at the same object, can see it in two completely different ways. This puzzle is rated by PuzzleMaster as a 5/10 difficulty level and I couldn't agree more. This is probably the easiest and fastest wire puzzle I have ever solved. 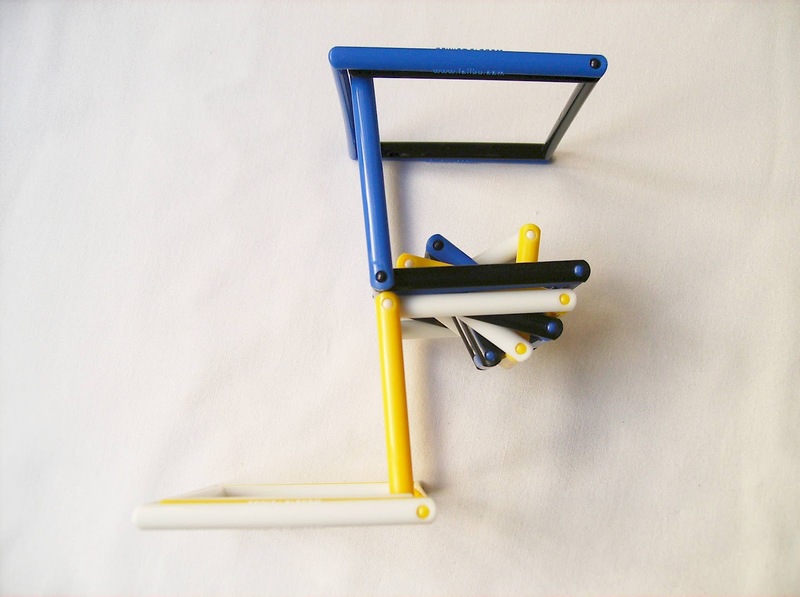 It took no more than a few seconds to look at it and do immediately the exact movement to take it apart. The movement needed to solve it is so simple that putting it back is equally easy. No challenge there. If the solution is not that obvious to you, I can give you a hint: take advantage of the U section of the heart shape, which is the main focus of the solution. For a graphical solution, download a .pdf file here. 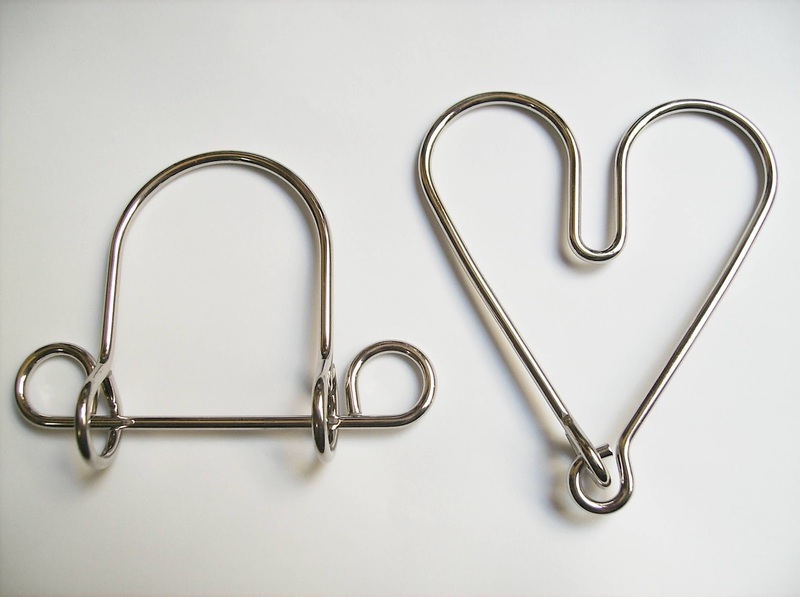 The Heart Breaker is available for about $10 CAD, along with many other affordable PuzzleMaster wire puzzles. If you prefer the Tucker-Jones House original instead, although a lot more expensive, they also have it available. As mentioned in my previous review, I prefer the cheaper version, because I like the material better, with the smooth coating finish. The Heart Breaker may not be recommended for you if you're experienced with this kind of puzzles. However, they can be useful for beginners to learn the ropes and adventure themselves later into more challenging and fiendish wire puzzles. Truzzle is my most recent discovery from Avoudrey, France. 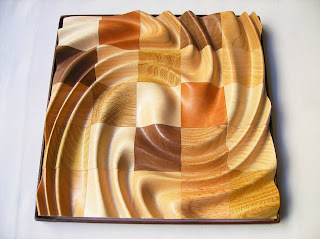 These marvelous hardwood sculptures designed by engineer Frank Paris are some of the most beautiful puzzles I ever had the pleasure of adding to my collection. 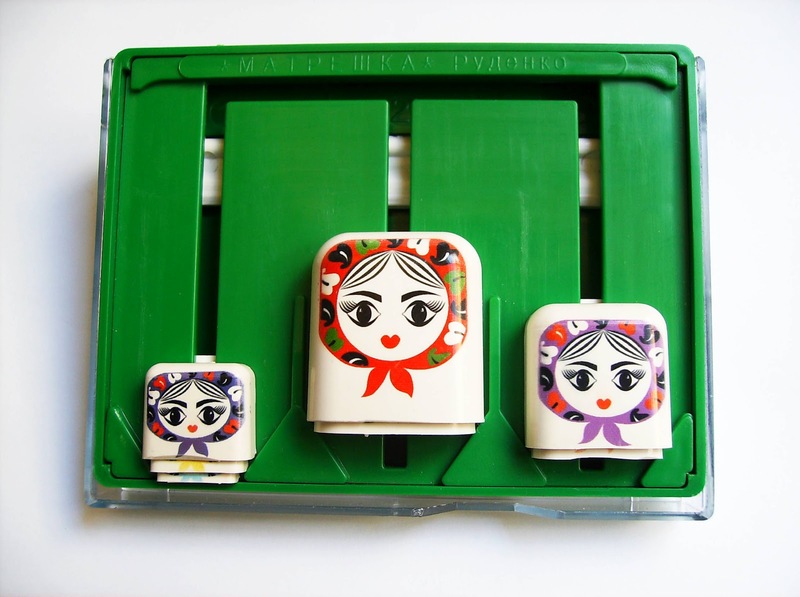 The first Truzzle puzzles were released in December 2003 and since then, a wide variety of different designs are being distributed in many stores across the world. It's a little hard to classify in just one word the Truzzle puzzles. They are so unique and original that they should have their own category. You can think of them as some sort of Jigsaw puzzle or a 2D Packing Puzzle with raised pieces - 2D, because you solve it only on an horizontal plane or flat surface... But then again, if the pieces have raised lines and curves, it makes it more of a 3D puzzle than 2D. You can see now my uncertainty trying to classify them. 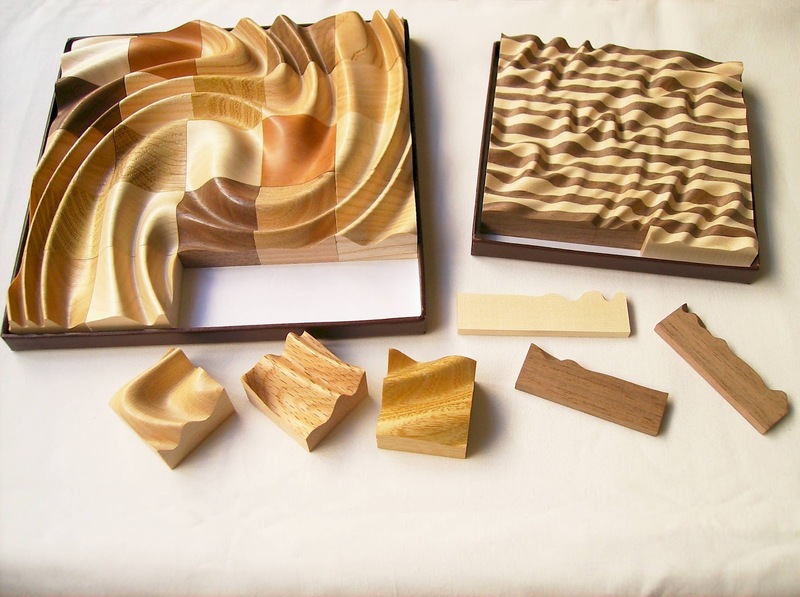 The puzzles come in two sizes (18 x 18 x 2.1cm and 12.5 x 12.5 x 2.1cm [about 7" x 7" x 1" and 5" x 5" x 1"]) and six different wavy patterns (animal, astral, atoll, mesh, spiral and wave). Within each pattern there are two types of pieces (cubes or lamellae strips) and they range from 25 to 108 pieces, depending on the size or type of piece. 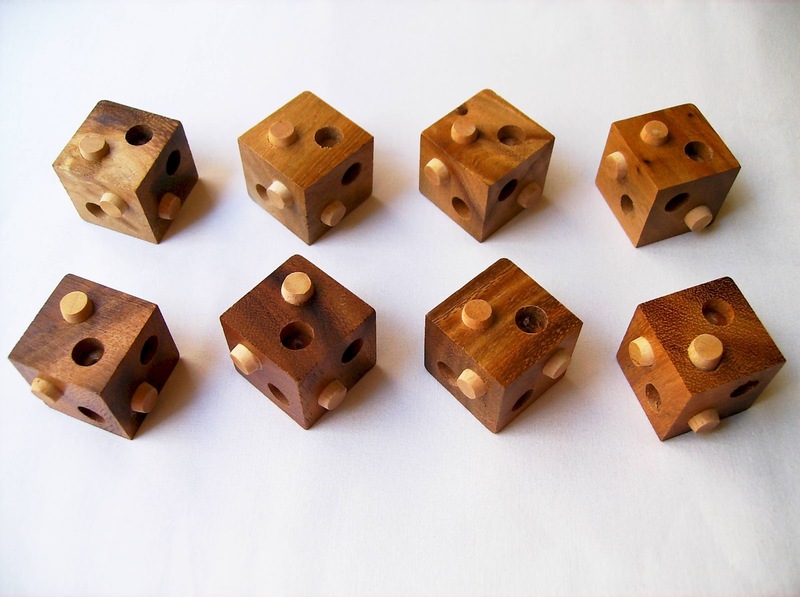 Their solving time can be from 30 minutes (the easiest) to 6 or 7 hours (mesh or "maille" and wave or "vague" big size, lamellae with only one type of wood and 108 pieces). Also, within each type of pieces you can choose between five different color schemes. 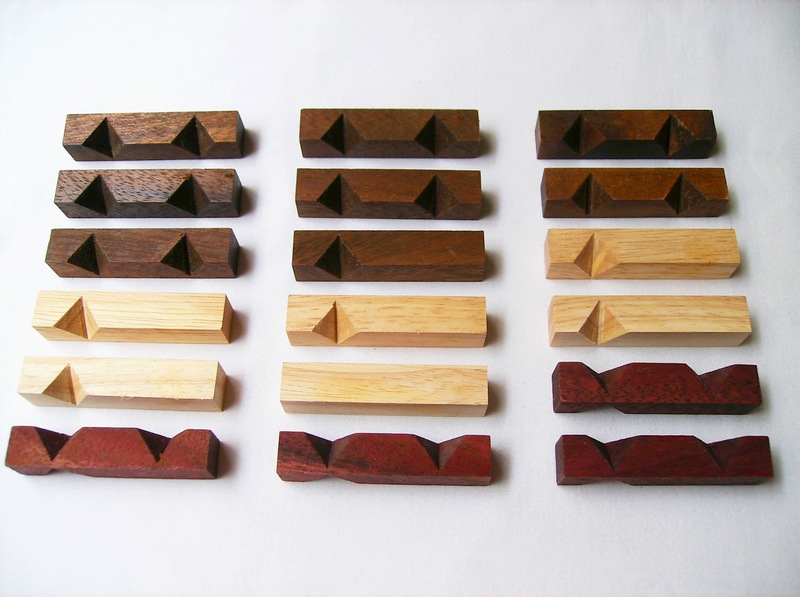 If there's not enough variety for you already, for an additional fee, you have the option of choosing your own wooden types from a selection of sixteen species from the region. I got two different Truzzle designs and sizes recommended by Frank himself. I'll describe below, in more detail, each one. This classy spiral version is my favorite from the six available patterns. It comes in a cardboard box with a maroon leather looking lining and inside, 25 cubes with extremely smooth surfaces in a checkerboard pattern, each measuring exactly 3.6cm (1.42") in a 5x5 grid, make a strikingly beautiful spiral motif. 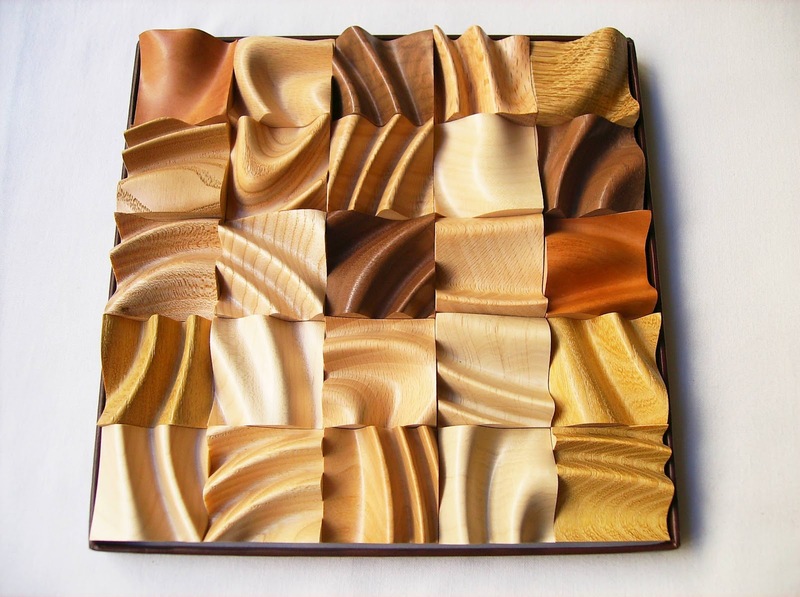 This multicolored version is described as having a minimum of three different contrasting wood types, although within a particular wood species, you will probably see a few variations in tone, creating an array of different colors, thus making each puzzle unique. This particular version however, has all kinds of woods used by Frank, except for Alder. Quite a unique puzzle. This spiral version is rated as a 1.5/6, so it's not exactly the most difficult one they have. However, it's the recommended one to start and familiarize yourself with the concept before attempting more complex ones. Fooled by the apparent easiness of the puzzle, I immediately drop them on the table and scrambled them to try and solve them for the first time. Suffice it to say, it was much more difficult than I was expecting. It took me approximately, an hour and a half to completely solve it. I do have to say, once I started to solve it, I didn't look once to a solved picture. It was all from memory. I had an idea of what the finished spiral pattern looked like, but when you see a bunch of pieces lying around, all having similar wavy curves and lines, it can get pretty confusing. Your pattern recognition skills will sure be put to the test. When you solve a jigsaw puzzle, it's common to start by separating the edge pieces and build the frame first. The Truzzle's case is different, because you have only cubic pieces, so it's hard to see which ones are the edge pieces. Instead of starting from one corner and work my way from there, I began to join groups of two or three pieces together and after that I joined those groups in bigger groups until I had the complete puzzle. Video: Animated video showing the puzzle being solved. Watch in Youtube. If blocked, see this one instead. The second Truzzle I got was a wave (or vague in French), with lamellae strips in a small size. The lamellae version is a little more complex than the cubes', mainly because you have a much larger number of pieces to work with. Also, the smaller surface area of the top of the pieces, makes it harder to recognize exactly where it belongs in the pattern. This particular design has 50 pieces divided into two contrasting wood types in an alternating light-dark strip pattern. Each strip is divided into two pieces, but to make it a little harder, they are not the same size, so each color will have three or four different sizes. When you scramble the pieces, one of the first tasks you should do is to try and separate the pieces into groups of the same size. This way it's easier to know which pieces can be used at a certain time. Given that this puzzle is much more difficult than the previous one (3.5/6), I was already expecting it to take even more time to solve. Much to my surprise, it didn't... It took me about an hour. The reason was that I came up with a pretty good strategy, which helped me to cut down the otherwise longer time needed. 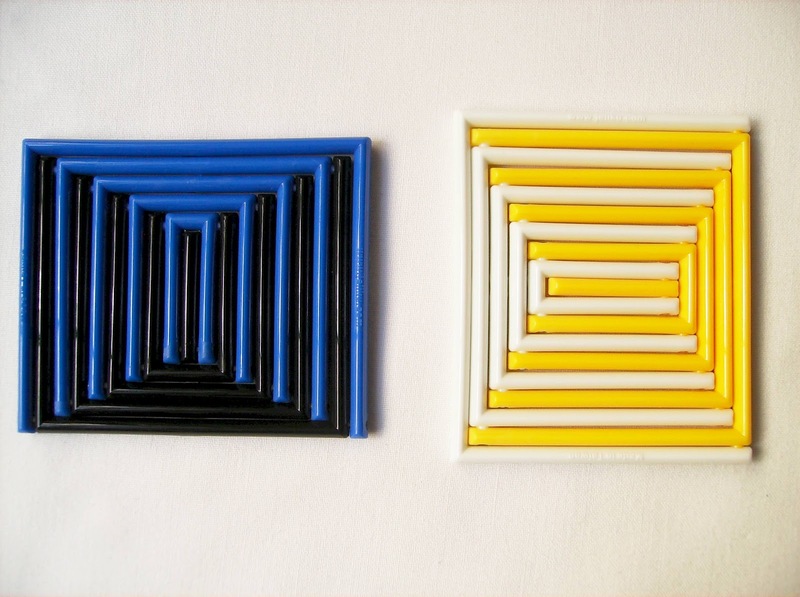 To solve the puzzle, there two known facts that can help you: the strips have an alternating pattern and each strip is comprised of two pieces. Since there are more than two sizes of pieces, it's good to separate them in groups first. 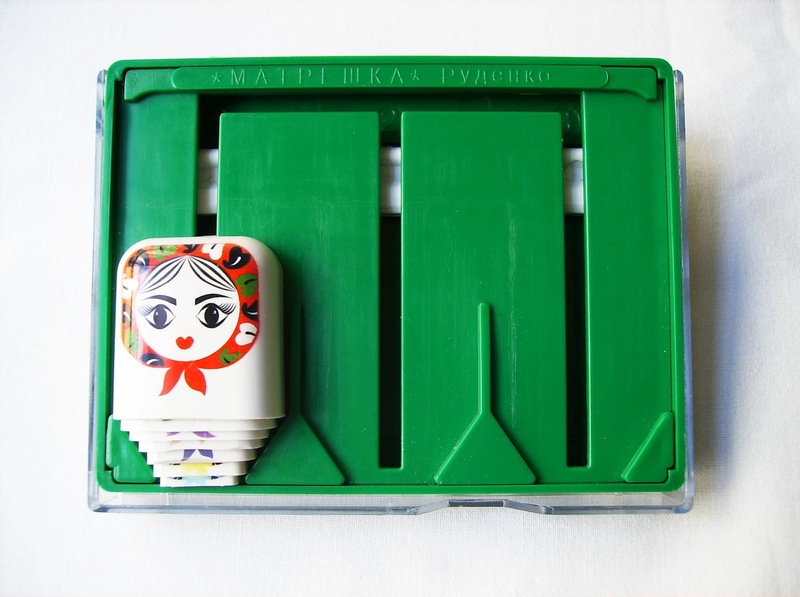 Next, you'll check one by one the pieces that have a perfect match. While at first this seems like a daunting task, it does get very simple as more and more pieces are matched together. Once you have all 25 strips done, it's time to see the ones that form the correct wavy pattern. In this case, I had to look at a solved picture to make sure which strip was the first. After that, it was an easy challenge and it was solved in no time. Video: Animated video showing the puzzle being solved. The Truzzle puzzles can be purchased directly through the official website, but the only available payment methods are credit card and check, no PayPal. They do have a list of physical stores throughout the world, so it's possible that you can purchase one near you. There are a few designs available at Amazon.com and also some at Oh! Toys store, although it doesn't compare to the supply and wide design variety at Truzzle.com. It's noted in Frank's innovative and brilliant woodworking, a very careful and utmost attention to detail, not to mention the quality of his products. Not only the Truzzle is a challenging and enjoyable puzzle in its own right, but it's also a magnificent and elegant work of art that can be displayed just for decorating purposes.